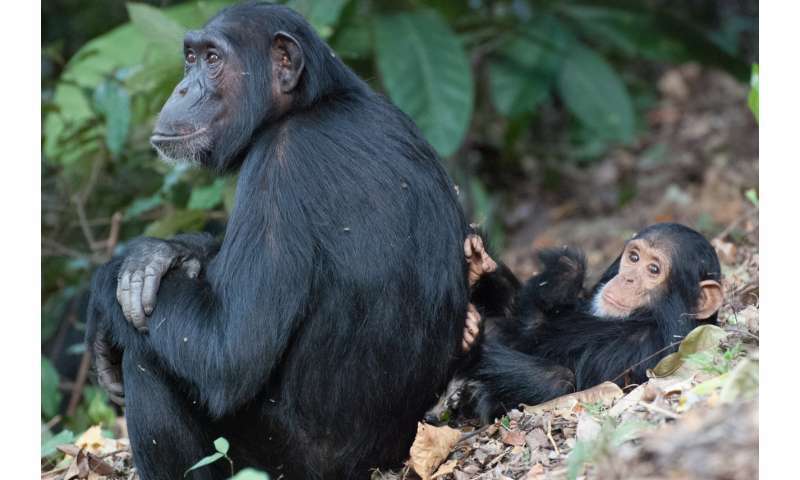 New moms need social support, and mother chimpanzees are no exception. So much so that female chimps that lack supportive friends and family wait longer to start having babies, according to researchers who have combed through the records of Jane Goodall's famous Gombe chimpanzees. Wild chimpanzee females in western Tanzania who leave home or are orphaned take roughly three years longer to start a family. The researchers analyzed more than 50 years' worth of daily records for 36 female chimps born in Gombe National Park. Stored in the Jane Goodall Institute Research Center at Duke University, the records are part of a larger database containing close observations of hundreds of wild chimpanzees, going all the way back to Goodall's first field notes from the early 1960s. Some female chimpanzees stay with the group they were born into their entire lives. Others pull up their roots and move to a new group when they reach adolescence, presumably to avoid inbreeding. The average age of first-time moms varies a lot, the researchers found. Females that stay home deliver their first infant around age 13. For migrants, it's 16. Several factors may contribute to the delay, the researchers said. Like all newcomers, they get pushed around, mostly by resident females. Having left their family and friends behind, they must jostle for position in the pecking order of a new and unfamiliar group. "It's a tough integration period," said Kara Walker, postdoctoral associate in the department of evolutionary anthropology at Duke. In contrast, stay-at-home females benefit from better support. Females also started reproducing earlier if their own mothers were around while they were growing up, particularly if their moms were high-ranking—in part because females with high-ranking moms get better access to food. Their head start on motherhood means these early bloomers have the potential to produce more offspring over their lifetimes, said Anne Pusey, James B. Duke professor of evolutionary anthropology and director of the Jane Goodall Research Institute Center at Duke. "This really raises the question of why some females stay and others go," Pusey said. The results also suggest that a lengthy journey from childhood to adulthood—long thought to be unique to the human branch of the primate family tree—may have deeper roots than previously thought. "This suggests that chimpanzees are, developmentally, much more similar to humans than was previously believed," says Christopher Walker, assistant professor of anatomy at NC State University. The study appears online Nov. 20 in the Journal of Human Evolution.